The MenACWY vaccine is given by a single injection into the upper arm and protects against four different strains of the meningococcal bacteria that cause meningitis and septicaemia – meningococcal (Men) A, C, W and Y. The MenACWY vaccination is being delivered to teenagers and first-time students in a carefully planned three-year programme. The priority is to vaccinate all teenagers from school year 9 onwards before they complete school year 13. There is also a catch-up vaccination programme for new university entrants up to the age of 25. 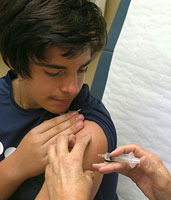 Children aged 13 to 14 (school year 9) will be offered the MenACWY vaccine in school as part of the routine adolescent schools programme alongside the 3-in-1 teenage booster, and as a direct replacement for the Men C vaccination. Students going to university or college for the first time, including overseas and mature students up to the age of 25, should contact their GP to have the MenACWY vaccine, ideally before the start of, or as soon as possible after the start, of the academic year. It can also be given on the NHS to older children and adults, and babies over six months of age, who need to be protected against measles, mumps and rubella, or in the event of a measles outbreak. Adults and children who are not immune because they missed one or all MMR doses when they were younger can have the MMR Vaccine on the NHS at any age.